Traditional Chinese Medicine (TCM) is a holistic medical system that dates back over 3,000 years. Traditional Chinese Medicine (TCM) is a holistic medical system that dates back over 3,000 years. Chinese medicine has a long history of treating skin conditions, starting in the earliest books over three millennia ago. TCM has its own intricate language, logic, and imagery for understanding health and disease. Health is defined as a state of harmony within a person as well as between the person and the universe. The TCM physician’s goal is to understand how a patient’s internal landscape, environmental factors, and skin symptoms paint a picture of the particular disharmony affecting that person. Before exploring TCM dermatology in depth, it is important to understand a few basic concepts about health and illness. The concept of harmony can be understood through the philosophy of yin and yang. Yin and yang represent complementary pairs- light and dark, hot and cold, and wet and dry. These opposites rely on each other to exist and provide a counterbalance for one another. In Chinese medicine, yin and yang also refer to the vital substances of the body. Health is achieved when yin and yang are in balance. Disharmony develops and disease occurs when yin or yang are out of balance. When we are in balance, this allows for optimal production and circulation of qi, our vital energy. As the universal energy in all things, qi comprises the building blocks of the universe. While quite mystical in origins, qi is a very practical idea within medicine. All people and animals use qi to stay healthy. The heart uses qi to pump blood, the liver uses qi to detoxify, digestion uses qi to obtain nutrients from food and get rid of waste, and skin uses qi to protect the body from illness and in order to look beautiful and radiant. We are healthy when qi is abundant and circulating throughout the body. A lack of qi or stagnation in its flow leads to illness. Healthy qi allows the body to produce sufficient blood which is another building block of health. Together, qi and blood work to nourish and moisten the skin and protect the body from pathogens. Yin Yin describes actions that are slow, calm, and restful and objects that are heavy, dark, thick, and cool. Disease occurs when yin is out of balance with yang. Less yin leads to symptoms such as skin dryness and heat. Too much yin leads to sensations of cold and poor blood circulation. Yang Yang describes actions that are fast, moving, and energetic and substances that are light and warm. Yang is energy to yin which is matter. Excess yang leads to symptoms such as dry, hot, and red. Too little yang leads to sensations of cold skin, chronic/non-healing wounds, and poor circulation. Qi The vital energy throughout the universe and individual. In the body qi nourishes, warms, moves, protects, and contains. Qi provides nourishment and brings nourishing blood to the skin. Too little qi the skin would be thin, dull, weak and prone to disease. Without qi, cell turnover and cell repair would not occur and wounds would not heal. Blood Blood and qi are in a yin yang relationship. The blood nourishes qi, and qi moves blood to nourish and hydrate. Without a sufficient amount of blood, the skin would be dry, rough, cracked, lusterless, and low in elasticity. Lack of flow of blood (stagnation) leads to thickened, dry, scaling, purple skin and masses. Illness occurs when we are not in balance. A disharmony can develop within an individual or between the individual and the environment. Both often occur simultaneously. It’s easy to see that the natural world has qi. We can feel the positive energy of the warm sun, beautiful sunsets, and the night sky. We also feel negative energy during drought, torrential rainfall, heat waves, and wind storms. Doctors used observations of the natural world to describe the disease they saw manifesting in their patients. For example, heat, humidity (referred to more often as dampness), cold, dryness, and wind are climatic pathogens which attack the body or develop within the body and cause disease. The internal balances develop when yin, yang, qi, and blood are in disharmony. Wind Just as in nature, wind moves quickly, & changes quickly. 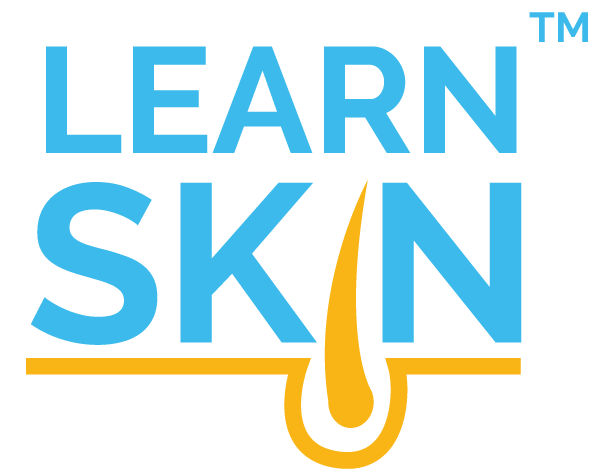 Causes common symptoms of itching, dry skin, and hives. Often affects upper part of the body. Cold Just as cold slows and stops the flow of water in nature, cold slows and stops the flow of blood and qi. A factor in cold, rough, thickened, and purplish lesions. It is also a common cause of Raynaud’s syndrome and some chronic masses & nodules. Heat (also called Fire) Just as in nature, heat rises upwards, moves quickly, and changes quickly. Fire pertains to many skin conditions in which you see redness, feel heat, and inflammation. Damp Just as in nature damp pools and is heavy. It commonly affects the lower body and is difficult to resolve. Dampness appears on the skin as edema, pus, crusting, and serous fluid in vesicles. Dry Dryness occurs both from dry environments as well as soaps, detergents, and chemicals. It is both a pathogen and a result of lack of circulation of qi and blood. 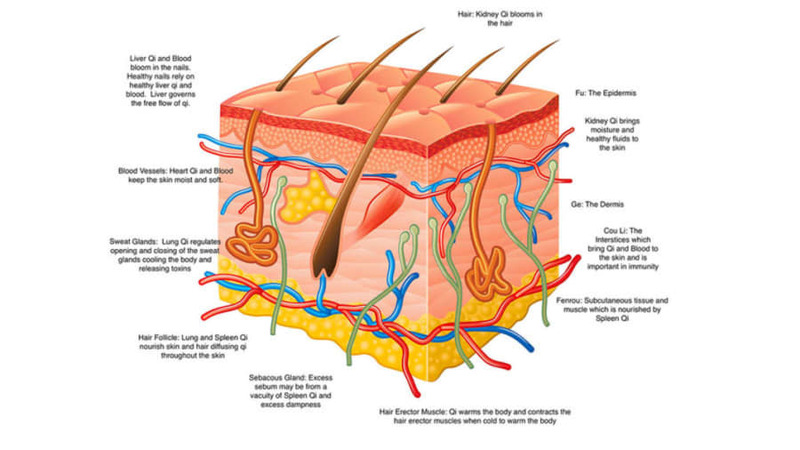 This relates to any skin condition where you see or feel dryness - rough skin, fissures/cracks in the skin. Summer heat A pathogen which occurs in the summer or with extreme sun exposure. It easily injures the yin and fluids. May manifest as hot, prickly, red skin such as sunburns or with boils and vesicles. The TCM doctor aims to understand how a patient’s vital energy reacts with climatic pathogens through observing skin symptoms and overall health to paint a picture of the particular disharmony affecting that person. In TCM, one disease has many possible causes. Eczema, for example, may be caused by heat or dampness (among other imbalances) depending on how it appears and the accompanying symptoms. Each of the climatic pathogens has their own characteristics within dermatology. For example, heat causes redness on the skin while dampness may cause swelling (among other symptoms). Qi and blood disharmonies also disrupt skin health. Too little qi leads to undernourishment of the skin and dryness. When the qi is stagnated, it is not flowing, and skin may develop dark spots. Disharmonies of qi and blood allow for pathogenic qi to develop within an individual or to attack from outside, in the environment. An individual and the universe are energetically intertwined and so are always influencing one another. One way TCM is a holistic medicine is because it views the specific condition of the skin as it relates to the health of a person as a whole. Chinese medicine has developed its own unique physiology by which to group functions of the body together to better understand their interconnected relationship. Emotional and physical health are also interwoven. While the organs have the same names as the biomedical organs, note that some functions differ between the systems. Lung The main role of the lung is breathing which brings in qi from the air. The skin is most related to the lung as it is connected to the outside world, it is involved with protects from pathogens and exchange of substances with the environment. Makes skin dense and strong to repel and protect against external pathogens. Deficient lung qi will result in dry and rough skin and withered hair. Other symptoms may be excessive sweating, edema, and chronic cold. Spleen Along with the stomach, the spleen is in charge of digestion for the creation of qi, blood, and body fluids. It also controls and contains blood. Provides the appropriate amount of nourishment and moisture to the skin so that it is thick, with great elasticity, and luster. Also protects against bruising and aids in skin detoxification. Liver Stores the blood and promotes blood circulation in the body. It is the organ that assures the smooth flow of qi. Provides more material substance and ensures that it moves appropriately to moisten and nourish skin throughout the whole body. Liver is also addressed if emotions exacerbate a skin condition. Kidney Moves water throughout the body. Similar to in biomedicine, kidneys play a role in urination. Kidneys are also a major storehouse of vital substances such as qi. By maintaining the balance of water and fluids and supplementing the blood, the skin can be further nourished. Abnormal sweating patterns, skin dryness and edema may be included in Kidney pathologies. Strength of the kidney qi is shown in the hair. Heart Moves the blood through circulation. TCM says that the spirit, both our ability to interact and overall emotions, are stored in the heart. Provides the skin with adequate amounts of blood in order to be moist and soft. Strong emotions such as stress, frustration, and depression can exacerbate skin conditions. Healthy: Kidney qi, blood, and yin nourish the growth of the hair. Imbalances: Kidney qi and blood deficiency creates a lack of nourishment and leads to hair loss/thinning and graying. Liver qi stagnation creates a lack of nourishment and causes hair to fall out. Healthy: Heart qi moves blood through the vessels, nourishing the skin. Imbalances: Qi and blood stagnation lead to lack of circulation and the development of dark spots. Spleen qi deficiency results in qi that cannot maintain healthy blood vessels and leads to bleeding. Healthy: Qi and blood moisten the skin. Dampness and heat result in an overproduction of oil and inflammation of glands. Healthy: Qi and yang raise collagen producing healthy full skin. Imbalances: Kidney qi and yang deficiency leads to a lack of collagen production. Healthy: Ample qi, blood, and body fluids produce sweat. Lung qi regulates the opening and closing of pores. Lung qi deficiency or heat leads to excessive sweating. Dryness leads to limited sweating which can put the health of your skin at risk. Another TCM lens to understanding health and harmony is the 5 elements. It is based on the idea that the elements make up the universe also make up us and our bodies. Balance, movement, and the relationship of these elements reflect and influence health. Each of the elements are related to specific functions and organs in the body. The relationships of the elements to one another are another perspective on the interrelationship between functions of the body which can inform a diagnostic or therapeutic approach. Fire Has the quality of heat and upward motion. Fire propels qi and blood through the body warming it. Generates earth, controls metal, and relates to the Heart organ. Associated with the heat of Summer. Natural fire in the body keeps skin healthy. If fire becomes excessive, skin conditions in which you see redness, feel heat, and inflammation develop. Too little fire can lead swelling from to poor circulation. Earth Brings nutrition and health to the body. Generates metal, controls water, and relates to the Spleen organ. Associated with late Summer when nature is in peak. Earth provides the nourishment to skin. Too little earth element results in undernourished skin. Swelling and dampness may develop. Metal Metal does the work of change. Purifies, eliminates and reforms. Generates water, controls wood, and relates to the Lung organ. Associated with clean forest air of autumn. Metal purifies and protects. Deficient metal will lead to dryness: dry skin and hair. Other symptoms may be chronic colds. Water Water moistens and moves downward. Generates wood, controls fire, and relates to the Kidney organ. Associated with winter, a time when body’s energy is stored. Water nourishes the skin. Storage of the body’s qi and essence. Weakness of water leads to dry skin and malnourished hair. Wood Wood has the characteristics of growth and up bearing. Generates fire, controls earth, and relates to the Liver organ. Associated with Spring a time of growth. Excessive wood leads to wind causing itching and affects the upper body. Deficiency of wood can lead to blood deficiency causing dryness and itching. The generating and restraining cycle is an approach for understanding the interrelation of the body’s functions. For example, wood generates fire and controls earth. Wood supports fire’s functions but restrains earth from overworking. If wood becomes too weak, it cannot support fire leading to poor circulation. If wood becomes too strong it will over control earth damaging the digestion function. Wiseman N. Fundamentals of Chinese Medicine. Paradigm Publications. 1996.